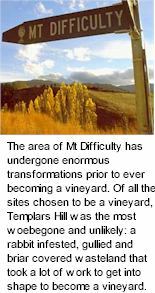 By virtue of their prolific range of single vineyard editions, assembling parcels with the greatest synergy are central to the production of a Mt Difficulty in perfect balance. Fruit is sourced from the south side of Kawarau River at Bannockburn, where different clonal parcels on the same block, which can ripen together, are handled as a unique individual parcel. Exhibiting an amazing weight of fruit on the palate, a powerfully structured Otago Pinot, fleshy and plushly textured, finishing with a lovely extraction of velvet tannin and perfumed cherry plum richness. Attractive dark burgundy colour. Deliciously perfumed aromatics, dark red and black fruits of the forest dominate, underpinned by lifted floral notes. A palate of lovely elegance and flow, striking precision and clarity, plush dense fruit of the forest flavours, plushness moves beautifully into the mid palate, fine elegant textural tannins frame the fruit and acidity before a lengthy finish.